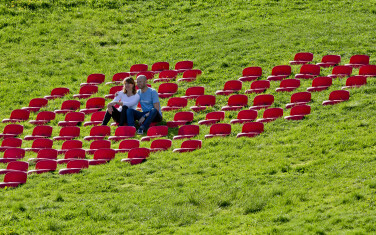 Gigseat was conceived by entrepreneur Marianne Texmo, who after attending numerous outdoor concerts and other cultural events became fed-up with the lack of available places to sit - often having to stand for long spells due to the ground being either wet or muddy. 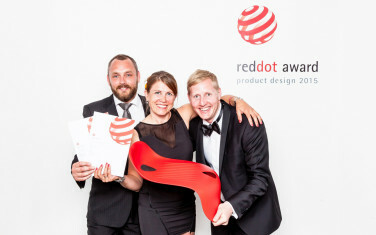 Our product designers at EGGS came on board after being approached at an embryonic stage, and have since helped with all industrial design and refinement of the original concept. 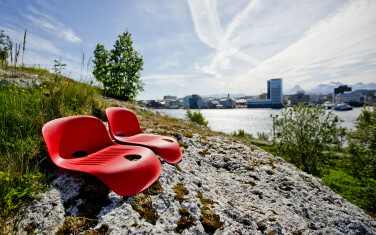 Made of durable thermoplastic and available in all kinds of colours, Gigseat is an ergonomic step-like seat that allows you to comfortably sit anywhere. It’s shaped in a way that adapts to a wide range of terrains, be it steep, hilly or flat. On either end, there’s a triangular shaped hole that’s designed to house a plug-like grip to avoid any sliding around. These holes act as a practical drinks holder too - brilliant for when you’re on uneven ground and want to be hands-free. Weighing only one kilogram, Gigseat is light to carry. It fits snuggly against the contours of your back, under a rucksack. Each seat stacks neatly on top of another making Gigseat easy to set-up and store away afterwards. It also takes up far less space than other regular-type seating. What's more, Gigseat can be linked together by way of a pliable rubber connection unit. This flexibility allows for combined seating almost anywhere - perfect for large parties attending an event together. For event mangers, Gigseat provides a convenient arrangement for whatever event they’re staging. Throughout the whole design process both Gigseat (the company) and EGGS gained substantial insight into the various possibilities of Gigseat by rigorously testing it out on potential users. Safety, ergonomics, logistics and aesthetics were all considered and thoroughly fine-tuned along the way. Portraying a strong brand identity, and with a distinctly modern look, Gigseat is destined to be the standout attraction at many outdoor concerts and events from now on!